Mead Open Farm’s position in the marketplace was reviewed and it was decided that a clearer and more distinctive visual identity was required. The Mead Open Farm logo was developed, and full brand guidelines created, enabling staff to support implemention of the new brand in-house. Initially, we designed an eye-catching set of characters (hand drawn) which were to become the basis for all communication. These characters were used to hold up entrance signage and also applied as a montage to create a border for advertising material. The result was a strong, consistent and easily recognisable brand. As part of this project we created new look leaflets, advertisements, posters (including 48-sheet billboards) and signage. We have also created specific illustrations for Easter, Halloween and Christmas, and continue to support Mead Open Farm on an ongoing basis. Rare Design works in partnership with Agility Marketing on all design work for Mead Open Farm. The new site is designed in a way that allows the personality of the brand to come through. 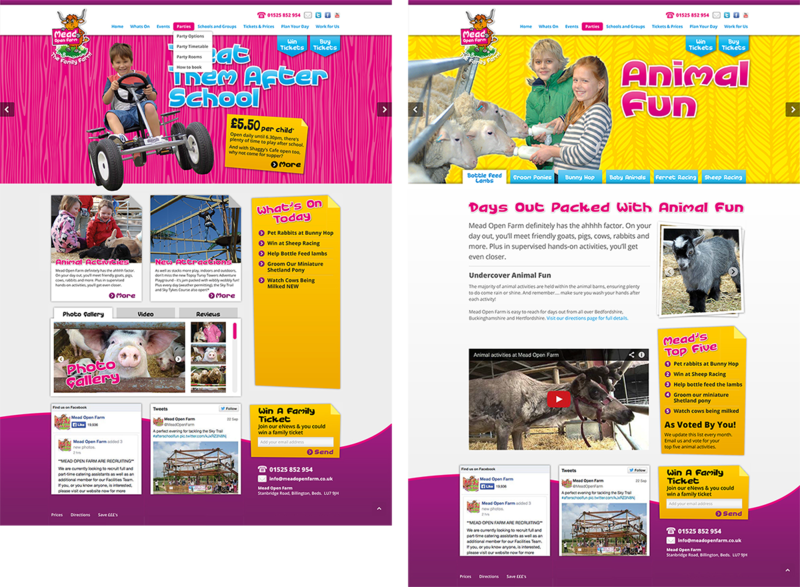 Mead Open Farm is fun and colourful and so is the design of the new website. With the use of bold typography and images, the design system is solely focused on highlighting the upcoming events, the savings that can be made by booking online and the all weather play. Interactions and animations bring the site to life in a way that is easy to use. When thinking about the homepage, we spent time considering where our users were coming from. Because a large portion of users were coming from blogs and social channels, we wanted to create an experience that promoted similar content to what pushed them to the site in the first place. The home page (as well as the entire experience) is built using various components and layout modules that can be mixed and matched to tell seasonal stories, push new events, and highlight editorial content. We created a range of design solutions for this project, ranging from clever z-fold leaflets to cost effective postcards, ensuring the message was accessible to the largest audience possible. to help promote key events!